Brent from our Peninsula store is off this week to ride RAGBRAI, the infamous 7-day Register's Annual Great Bicycle Ride Across Iowa. Saturday is usually the travel day, which involves taking a charter bus to the starting point on the western edge of the state. He sent this picture, which he was quite exicted about. 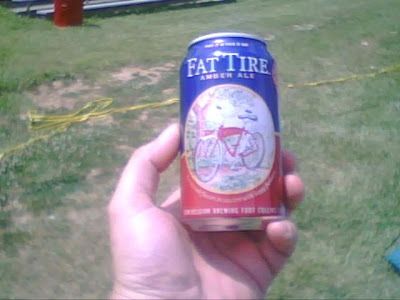 Fat Tire Amber Ale comes from the New Belgium Brewing Company in Fort Collins, Colorado, and is difficult to find outside that state. We'd never seen it in cans in any state. Jason, who worked for us in Peninsula last summer, has a friend in Colorado who passed off a case of the cans to him recently. Jason lives in Kansas now, but is originally from Iowa, and rides RAGBRAI most years with his father and their local bike club.